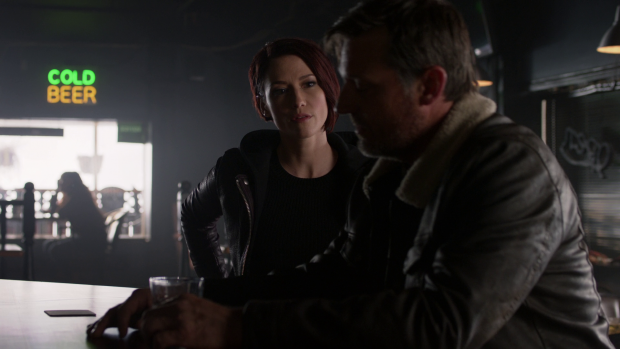 Supergirl delivers a shock reveal during Kara and Mon’El’s interstellar road-trip as Alex has an experience that shakes her world view in a really profound way. This is one of those episodes of television that’s a really confusing one to write about. There’s very little actually wrong with it in that it accomplishes exactly what it sets out to do but the whole manages to be far less than the sum of its parts in various ways. Considering how much this episode delivers in terms of significant characterisation and reveals it should be more impactful than the distinct workmanlike quality suggests. Alex’s arc is a prime example of this. She receives some life changing development due to her experiences but it can’t help but come across like another day at the office. Having her be put in constant danger by an unseen assailant is theoretically a great source of tension because a mystery is a great way to do that but somehow this plot manages to be bereft of urgency because Alex doesn’t seem all that phased by it. Part of the problem is that the pay-off is so weak because it doesn’t amount to anything that feels that dangerous. It’s easy to make comparisons to last season’s “Alex” because that episode also deals with someone from her past trying to kill her and develops that type of story far better. Bringing back the corrupt Sheriff Ronald Collins from “Midvale” because he’s the first person Alex arrested is inspired because it forces Alex to consider the choices in her life that have brought her to this point. Law enforcement comes so naturally to her that in many ways there was no other path her life could take. She mentions being lost before J’Onn recruited her into the DEO so the resulting implication is that bringing aliens to justice was very much her calling and gave her life some direction. Using the lens of youth and the reminder of her first arrest to remind her of that is a nice touch because it makes good use of what the show has previously established to inform how Alex changes. The answer to the mystery is underwhelming because it doesn’t mean anything. Using the brother of an alien she arrested some time ago has no weight to it because he amounts to nothing as far as a villainous presence goes. Seeing Alex tear across the rooftops with no thought given to her own well being makes for a thrilling chase and it makes the city feel more expansive than usual but it fizzles out once the identity of her attacker is made known. Early on the episode continues the growth of Alex and Ruby’s relationship. With Sam currently out of the picture Alex is in the role of Ruby’s guardian which furthers her own journey towards being ready for motherhood. She makes some notable missteps along the way as we’ve seen in recent episodes but she is open to learning and certainly adores Ruby while feeling an obligation to her. This forms the basis for her self reflection towards the end of the episode. She realises that her style has always been to throw herself into danger without considering the personal consequences because the mission has always been more important to her than her own life but with Ruby as part of the equation her perspective is changing on that. If her leap of faith had went another way and she had died then what does that mean for Ruby? What does that mean for the child she hopes to one day have? Alex is learning about parental responsibility and everything that comes with that which brings the realisation that she has someone to come home to so shouldn’t be so quick to rush into danger because it could have negative consequences for someone dependent on her. It’s a really interesting examination of how priorities shift in line with changing responsibilities but might have been more impactful if the attempt on her life had been more significant. Making it someone connected to her past is a good idea in theory because it shows that Alex has lived a life where she has become a hated figure to a lot of dangerous people and the baggage associated with that could result in someone she cares about being put in danger. This would definitely have worked better if the almost anonymous foe had been replaced with someone the audience had seen before and had made an impression on them as well as her though I suppose no such person exists at this point. I’ll be interested to see how her approach changes after this now that she recognises Ruby’s safety as a priority especially when she could be all Ruby has if Sam can’t be saved. Ruby finds herself at a loose end with Winn reluctantly acting as her babysitter. I found this problematic because it was very out of character for Winn to be so hostile to her so his actions feel more motivated by plot than anything else. It’s clear that the aim is for Winn to be the support that would have benefited him when he was left alone without either of his parents. Ruby’s situation is very reminiscent of his so an obvious opportunity for empathy existed right away. It would have felt more natural than the manufactured conflict that felt very out of place. Winn has always been a character to show empathy to others such as his dogged determination that Lyra wasn’t as bad as she appeared to be last season so his hostility towards Ruby makes absolutely no sense. It’s good that this is abandoned fairly quickly in favour of them bonding over their shared immaturity and life experiences but the fact that it took any time to get there is baffling. Lena is dealing with the prospect of making a very difficult choice. Reign is getting stronger all the time and could break out of her cell at any second. There is a small window of time in which she can be stopped with a lethal dose of Kryptonite but to do so means that Sam is lost along with Reign. Lena hesitates because she doesn’t want to be the one to kill her friend but she is also aware that the moment of truth is coming soon and she will have to make a tough call. James is there to tell her what she needs to hear by asking the simple question of what Sam would want her to do. The answer is obvious but Lena has been avoiding the question because she knows what the answer would be. If it means protecting Ruby and by extension the world then Sam wouldn’t hesitate to sacrifice herself so Lena shouldn’t hesitate to make that decision for her. Ultimately it proves futile because it is left too late but Lena was willing to do it before it failed and that says a lot about her strength of character as well as her innate ruthlessness. Her interactions with Reign are brief and obvious but interesting. Reign taunts Lena into questioning her own morality by delivering the usual “you’re just like me” platitude and it’s enough to distract Lena because on some level she believes that if she is capable of making a decision that results in her friend’s death then she may be no better than Reign. Of course the reality is far different because Lena does feel remorse for morally questionable actions and would never get over being the cause of her friend’s death whereas Reign feels no guilt over anyone she has killed. It’s not a debate that the episode has but it does linger in the background and I liked seeing Lena characterised as someone who is able to make difficult decisions while still not being wholly comfortable with them because she is fundamentally a good person. Kara and Mon’El’s interstellar road-trip leads them to an interesting discovery. 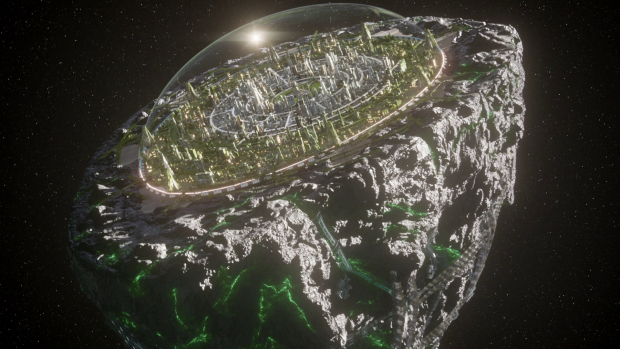 It turns out that a very large piece of Krypton survived in the form of Argo City complete with a large population. Kara learns that her people aren’t as dead as she thought they were and is faced with the revelation that one of the survivors is none other than her mother, Alura. This is yet another example of something that’s a really big deal. It’s possibly the biggest reveal the show has given its audience but it also manages to feel like another day at the office. This should be monumental in the implications it has and there is some attempt to have Kara feel overwhelmed by this discovery but on the whole it feels flat. Part of this has to do with really stilted dialogue, particularly between Kara and Alura. Their long awaited mother/daughter reunion feels like catch-up exposition rather than a mother and daughter reconnecting after each of them believed the other dead. Kara should definitely be more elated than she appears considering how emotional she is most of the time and how much she misses her mother as has been confirmed time and time again. 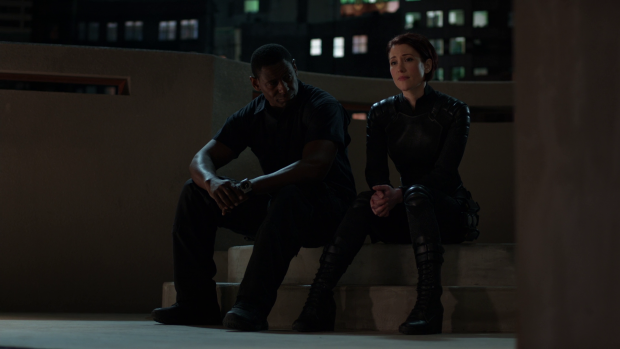 Instead they have a relatively passionless conversation before returning to Kara’s reason for being there. Another issue is the casting of Erica Durance. She isn’t a bad actor and definitely isn’t bad here but the recasting of Alura from Laura Benanti who managed to put a lot into the role despite not playing it that often while also crafting a nuanced character in the form of her twin sister Astra who served as one of the main antagonists all the way back in the first season. Laura Benanti putting such a defined stamp on the character makes it difficult to accept someone new in the role especially when Erica Durance has made very few appearances. 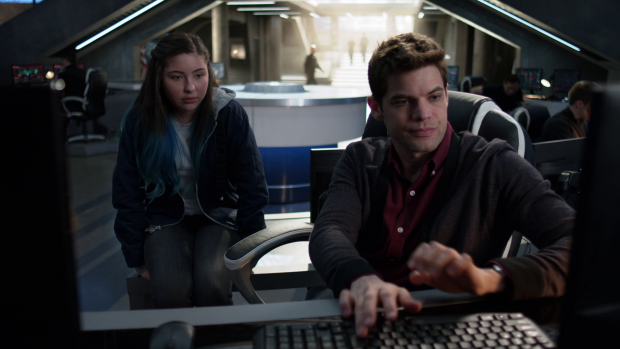 Perhaps this could have been fixed by featuring the Alura hologram more frequently to make an attempt to create a connection between Kara and this new Alura. Melissa Benoist and Erica Durance do their best but without any basis for the relationship that exists between the two actors playing these characters it can only go so far. This combines with some awkward sounding dialogue to make for an underwhelming reunion that should have numbered among the show’s finest moments. A systemic issue exists now that Kara’s mother is alive and has been all this time. It somewhat cheapens a lot of Kara’s motivation even though she had every reason to believe that Alura was dead. Loneliness and loss are hallmarks of Kara as a character in this show so undoing this by having her mother be alive means that much of this goes away. 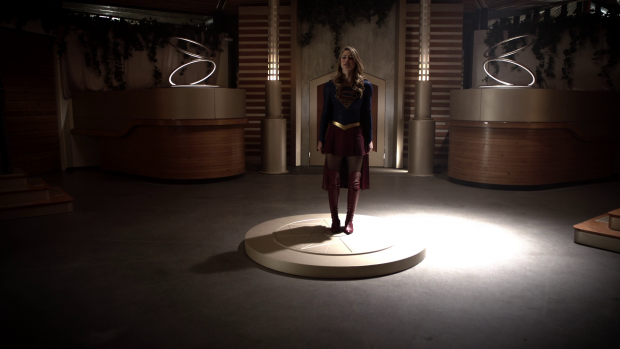 In this particular episodes Alura represents a tangible connection to Kara’s people. Without her then arguably Kara might favour her life on Earth but Alura’s presence increases her desire to uproot and live in Argo City getting to know the mother she thought she lost. If everyone of import who dies is brought back at some point it makes everything fairly consequence free which is never good for storytelling. It’s very possible that Kara will end this season watching her people and her mother die for a second time though I think this would be too dark for Supergirl as a plot line. It’s more likely that Alura will be killed forcing Kara to deal with losing her mother for a second time. Kara’s appeal to the council is equally stilted because Melissa Benoist is playing Kara making a speech that she would never make. I suspect the attempt is for her to use more formal language so that the council takes her request more seriously though it doesn’t mesh very well with Kara’s appeal being one from the heart. Going down a more emotional route is perfectly in keeping with her character as she stands in front of her own people representing humanity and making a case for why they deserve to be saved but her language should support that rather than hinder it. Having her not be taken seriously before getting through to those she addresses by appealing to their better natures could have come across as a really profound victory that perfectly encapsulates why Supergirl is such a beacon of hope. There’s an interesting debate at play here. It is made clear that Argo City isn’t Krypton and that their underlying philosophy is to learn from the mistakes that doomed them as a species. Alura has a lot of personal regrets when she imprisoned criminals in Fort Roz dooming them to a life of torture and captivity. It makes sense that she would want to atone for those mistakes and sees helping Kara as a way to do that. The Worldkillers are a representation of Krypton’s past misdeeds and as a people they can make a small sacrifice in order to begin to make up for them. The other side of the argument is equally strong with Jul-Us (Tim Russ) representing the stance that Argo City has nothing to do with the Worldkillers or anything else that forms part of the legacy of Krypton of old. He’s very much a symbol of the future that takes lessons from the past but writes off the mistakes as being learning experiences that don’t need to be corrected. It’s a problematic stance for sure but it’s also clear where it is he and others like him are coming from. The fact that the major conflict that Kara is involved in during this episode boils down to a debate is a choice I can definitely get behind in a big way as it provides more depth to Kara as a hero with her being able to resolve issues without fighting. Supergirl is an example to others so the central conflict is about her setting that example. In the end the vote swings Kara’s way and she is able to take a piece of the stone back to Earth though it’s heavily hinted that there is more to the decision than is on the surface. The swing vote is delivered by Selena who also happens to be the hologram that gives Reign her directives which strongly suggests that bringing the stone back to Earth is all part of the plan. Kara’s return to Earth and ends the episode and her confrontation with Reign takes the form of a cliffhanger so the answers will likely be supplied next week but it does certainly appear that this solution will make the problem worse. I’m hopeful that Argo City will amount to more than a plot device. It very much takes on that role this week with minimal attention given to how monumental this discovery is for Kara. Now that she knows that there is a large Kryptonian population out there will she be torn between her life on Earth and her desire to be among her own people? This is something that definitely needs to be addressed because the temptation for Kara should be great considering she has struggled with a sense of place for her entire life. This very episode mentions that she struggles to be herself on Earth because she hides so much from those she cares about but in Argo City she can be her true self; at least as she currently sees it. With her mother and her people she can be Kara Zor’El with no secrets from anyone though she will be leaving a lot behind on Earth. It isn’t a decision that should be arrived at lightly and I’m interested to see how that conflict plays out. Is it too much to ask for Clark Kent aka Superman to have some involvement here as well? A serviceable episode that makes some really monumental developments feel like another day at the office. The attempt on Alex’s life doesn’t work as well as it should because the reveal of the culprit is very underwhelming and makes for a poor answer to the mystery. Having her past come back to haunt her to show that she has angered some really dangerous people over the years is a good idea and taking it all the way back to her first arrest is an inspired choice but the actual resolution falls flat. Using this as the basis of her rethinking her life in the context of her desire to be a mother works really well because she is reassessing her priorities now that Ruby is someone who depends on her at least in the short term. How this will play out is anyone’s guess but Alex is at a crisis point in terms of what she wants to do with her life. Winn being hostile towards Ruby is completely unnecessary as it delays a much better interaction when Winn’s past becomes important because he went through exactly the same thing she is dealing with. The best role for him at this point is to be the thing he needed most for Ruby so delaying that unnecessarily is a bizarre choice. 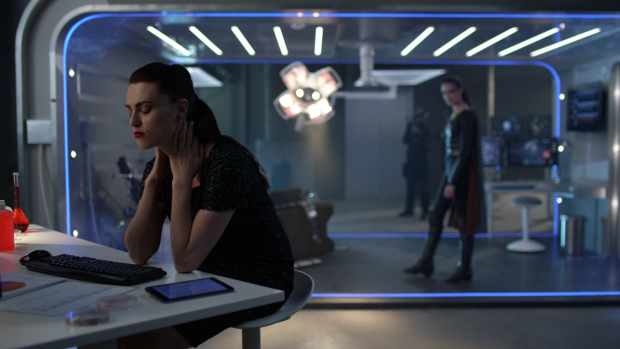 Lena wrestling with the difficult choice she might have to make should Supergirl not return in time is really well done. She is fundamentally a good person so doesn’t want to make the difficult call but when the time comes she is willing for the greater good. James helps her make that decision based on what Sam would want though Reign taunts her with the old “we’re the same” platitude that proves to be false but gives Lena pause anyway. Lena does make the decision too late for it to have consequences but the fact that she was willing to do it speaks volumes. Kara discovering an entire Kryptonian city and seeing so many of her people thriving should be more monumental than the episode allows it to be. 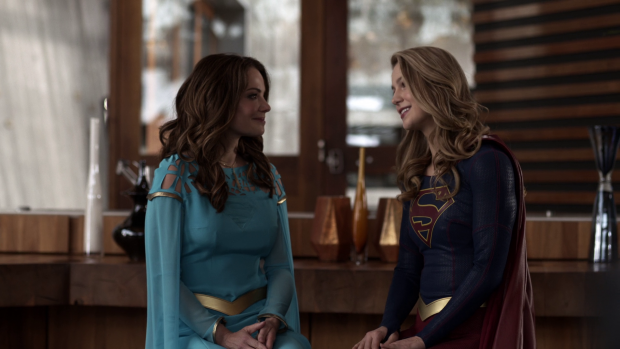 Stilted dialogue and the lack of a profound connection between Melissa Benoist and Erica Durance replacing Laura Benanti makes it difficult to invest in their relationship. The actors do their best but the connection can’t be so easily manufactured. Kara’s appeal to the Argo council to get what she wants is handled fairly well though Kara’s emotion based argument is let down by dialogue that doesn’t match. The central conflict of the episode taking the form of a debate around responsibility for past misdeeds as Kara represents Earth as somewhere that is worth saving is a great choice as it expands Kara’s role as a hero as well as what Supergirl represents. Hinting that taking the stone to Reign will make the problem worse adds extra intrigue and I look forward to Kara being conflicted over her life on Earth and the possibility of being with her people.